After countless hours of planning, we have to wonder if events like the Dinner & Jazz Night are worth all the work that goes into them; but then the night arrives and something magical happens! On November 16th we once again filled the Great Hall of the University of Toronto’s Hart House building. 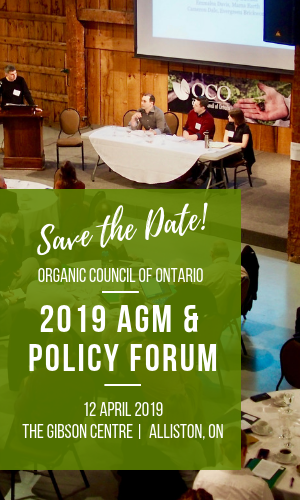 Guests included those who work within the organic industry as well as Co-farmer members and individuals wanting to learn a bit more about organics and the Organic Council of Ontario. Music by Tyler Yarema delighted the guests while Hart House’s Chef Marco turned out a 4-course organic masterpiece with 3 choices for mains including braised Fieldgate Organic short ribs, a pan-seared supreme of Yorkshire Valley Chicken filled with spinach and Organic Meadow swiss cheese, and a vegetarian option of cannellini bean & wild mushroom peperonata. The food alone was enough to inspire, but the experience was taken to a heightened level with each course being paired with an organic wine, graciously donated by their respective wineries and brokers. Wine pairings included the 2010 “O” Pinot Noir by Gilles Louvet Organic from Rare Earth Wines, 2008 Organic Cabernet Franc VQA by Frog Pond Winery, and a Vidal Ice Wine by Southbrook. Intertwined between the music, food, wine and lively conversations, Julie Daniluk, R.H.N., presented on the importance of supporting organic agriculture in creating both planetary and personal health. She highlighted numerous studies that show GMO and pesticide exposure contribute to a great number of health conditions including intestinal disorders, cancer and Parkinson’s. However, my favourite part of the presentation was her slide that showed a delicious homemade organic burger, french fries and lemonade which she prepared for less than the cost of buying the equivalent meal deal from MacDonald’s. Perhaps the most touching message was delivered by Matt Lurie, Founder and President of Organic Garage and this year’s official presenter of the Organic Dinner & Jazz Night. Matt’s message really helped us all understand why we were all there that night. Why we spent so many hours planning and promoting the event, and why all our guests took the time to join us. The theme of Matt’s speech centred on helping and this theme of helping was delivered through stories of his mother doing what she could do throughout Matt’s journey in establishing one of the most successful organic retail stores in Ontario. The full speech is available at http://www.organicgarage.ca/Media.php. Thanks to Matt’s speech, we all left clearly understanding our purpose for being there that night – to do what we can to help. The Organic Council of Ontario is working hard to shift the province towards more sustaining and organic agriculture and by doing so, reducing planetary and personal exposure to GMOs and pesticides. This is no small feat and we appreciate having the help of all our members and those who come out to our events. We sincerely thank Organic Garage for presenting this year’s Organic Dinner & Jazz Night. We’d also like to thank the Canadian School of Natural Nutrition for their sponsorship contribution. We also need to thank all the businesses and producers who contributed to the amazing meal including Fieldgate Organics, Yorkshire Valley Farms, Organic Meadow, Mapleton’s, Crofters Organic, Sprouts for Life, Cherryvale Organic Farm, Pfenning’s Organic Farm, Mapleton’s Organic, Just Juice, Frogpond Farm, Southbrook, and Rare Earth Wines. OCO’s next event is the annual Ontario Organic Awards taking place Saturday, February 2nd, 2013 at the River Run Centre in Guelph. The event runs parallel with the Guelph Organic Conference – one of North America’s largest and most visited organic conferences. OCO is accepting nominations for the awards until mid-December. The applications are very easy to fill out – which can be done here or can be downloaded and filled out and emailed to Jodi@organiccouncil.ca. OCO wishes to thank our many sponsors of the event including Organic Garage, Crofter’s Organic, Fieldgate Organics, Southbrook Winery, Creemore Springs Brewery, Frogpond Farm, Mill Steet Brewery, Organic Meadow, Pfenning’s Organic Farm, Cherryvale Organic Farm, Rare Earth Wines, Sprouts for Life and Just Juice.